I'm a huge fan of a gimmick. I know I shouldn't be, but I'm so easily swayed by cute packaging, quirky details and a sense of humour. 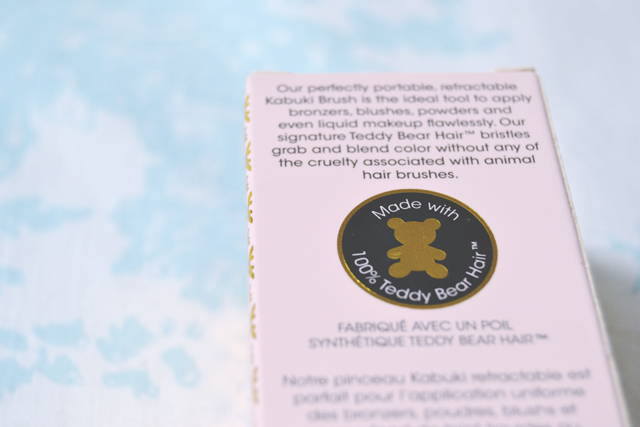 So when I saw Too Faced's brushes in Sephora made from teddy bear hair, how could I resist? 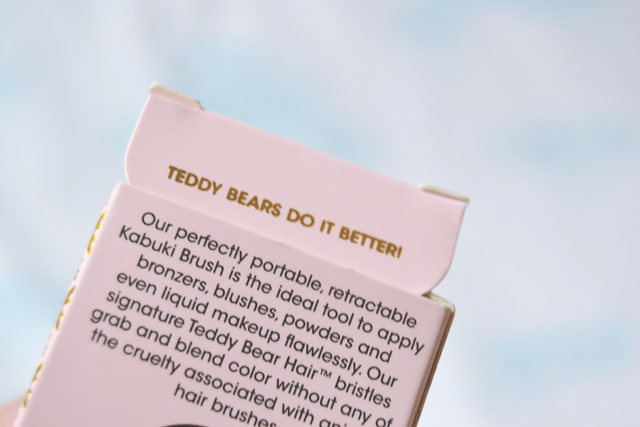 As a retractable brush, it is really practical, and the pink metallic packaging is sturdy enough to withstand bashing about in a bag. 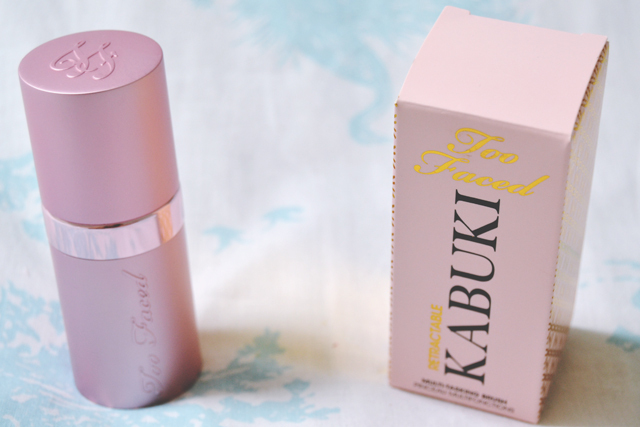 It also looks super pretty, with the Too Faced logo on both the side and the lid of the package, which is also a bonus! In terms of the brush itself, the fibres feel amazingly soft and luxurious. I could not stop stroking it and I was actually a little afraid to use it as it felt so wonderful. However, when I did finally bite the bullet (about 2 months after I bought it! ), I was very pleased I did! 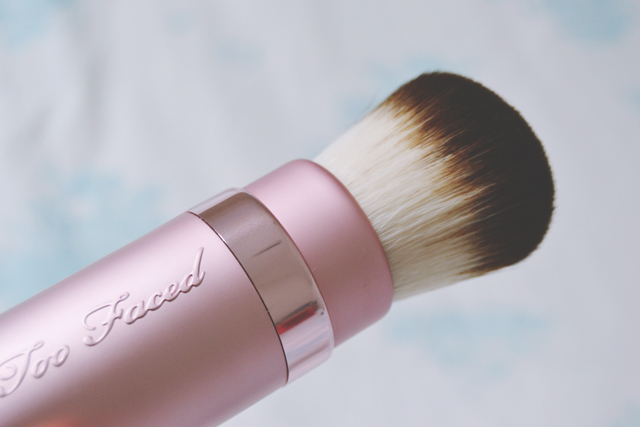 The brush picks up powder really easily and applies smoothly and evenly. With the large head of a Kabuki brush, it makes application simpler which is always handy, because who has time to faff about in the morning? I am completely in love with this brush! This is only the second product I've used from Too Faced (the other is the Sweethearts Perfect Flush Blush) but I've been blown away both times. I'm so glad the gimmicks have quality to back them up! I think you need to rectify that haha! So cute! I bet this is the softest brush ever. The teddy bear gimmick is really adorable, love the sticker. This looks way too cute! I haven't tried a retractable brush yet but I think I may put one on my wishlist for Christmas this year! Good thinking! Leave it to Santa! sold! well.....not really cause I'm on a #nospendingbeautyban. ughhh....but otherwise i would totally buy it!